Black Magic’s Equalizer harness and bucket are a standard bit of game fishing kit in this country, and are widely used all over the world. Probably the key design feature is the protrusion from the back of the base plate that fits comfortably between the legs and keeps the plate from being pulled to the side under pressure. This feature alone makes the Equaliser easily the best harness and rod bucket design available and this feature is protected by patent in many countries. 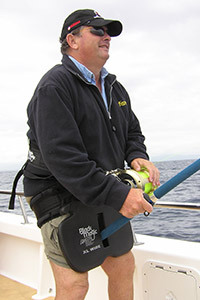 With the advent of the northern pacific bluefin fishery off the west coast of the South Island, the need has grown for a harness and belt that is capable of fishing very heavy drag pressures on 60kg tackle for hours at a time. This, added to the calls from some of the big blokes amongst us (and those who wanted to take a very wide stance for stability in rough conditions) lead to the development of the XL Wide Equalizer. Black Magic, in their thorough way, took nothing for granted, consulting with experienced anglers, trialling prototypes and even having a machine built to destruction-test the effects of high pressure on different gamble pin mounts. This research process has taken several years. The final result is the XL Wide Equalizer. It is wider and thicker than the standard model, and has heavier padding extending right to the bottom edge of the plate (which has more outward flare, easing pressure points.) A heavy stainless steel adapter is available for rods with short curved butts. The harness, too, is a beefier design; wider and stiffer with heavier padding to better resist any ‘bunching’ under very high pressure. The bottom section, designed to slide under the anglers behind and allow them to ‘sit’ on the fish, is like-wise of a heavier design to cope with the increased pressures of heavier specimens. Many design principles of the original Equalizer harness have been retained – the heavy duty ‘equalizing’ sliding harness clips, and back handle (so your mates can stop you from getting pulled overboard!) are examples. The XL Wide is a serious-looking bit of kit and hooked up to a set of scales allowed me to hold 20kg of drag pressure without discomfort, but what about on a fish? I took an XL Wide from Black Magic’s first production run on a trip in the Bay of Plenty late last summer. Aboard Rick Pollock’s Pursuit we were headed east in the blue water off the Motu when there was a fairly serious white-water explosion in the wake and the ‘moose rod’, my 80W Tiagra on a powerful 37kg Calstar rod, started loosing line rapidly. Strapping the XL Wide gear on and clipping on the big rig, I got stuck into the fish. With a fresh load of mono giving me faith, I went up to the button, slipped the bottom section of the harness under my bum and really put some pressure on as the boat idled slowly ahead. The rig felt great – no pressure points were obvious and the wide plate allowed me to take a wide, stable stance without it slipping out of place. The poor old fish never knew what hit it and inside ten minutes a decent yellowfin tuna hit the deck, right on the mark of 50kg. 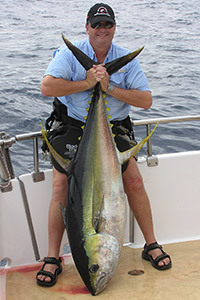 Ordinarily I would expect a yellowfin of this size, even on 37kg tackle, to take at least half-an-hour. Later in the trip I used the same belt and harness for some ‘puka fishing with 37kg braid. The fish were separated from the bottom structure with almost ridiculous ease, some nice eating specimens up to 25kg or so. Now granted, these early captures are not in the league of a big blue marlin or giant northern pacific bluefin, but the authority with which the harness handled the fish, its comfort, and its ability to put some serious pressure on, without discomfort to the angler, point to it being the go-to gear for big blokes or those taking on big fish with heavy tackle, stand-up style.